Jumping into puddles to make a splash may be one of childhood's greatest joys, but dealing with wet shoes and socks can be a parental headache. Clackamas County's solution is the Make a Splash program, which provides free Oaki rain boots to children age 6 and younger whose families qualify for income-assistance programs. 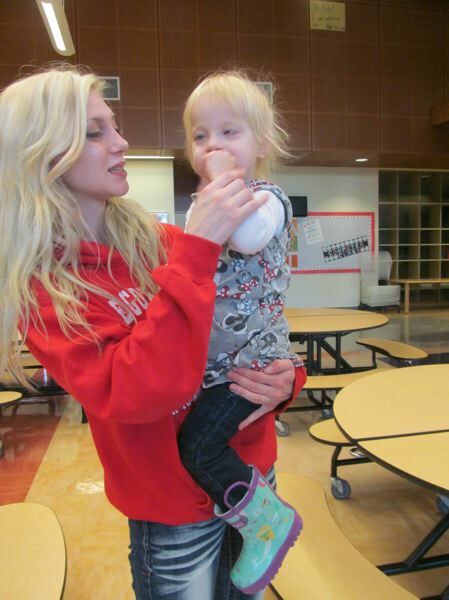 The Early Learning Hub of Clackamas County launched Make a Splash in October, distributing free boots at several sites. The rain boots will be offered at four more county locations through Nov. 29. Parents who are eligible for any assistance program, including Head Start, the Oregon Trail Card and free/reduced school lunch can visit clackamas.us/childrenyouthandfamilies/childhood.html to download an application form. Once the application is approved, parents will be given the dates and locations of the remaining rain boot sites. By providing young children with rain boots, "we hope to be giving them the opportunity to play, learn and explore outside," said Chelsea Hamilton, early learning program planner for Clackamas County's Children, Family & Community Connections Division, a division of Clackamas County Health, Housing & Human Services. "We know that children learn from experimenting in nature, from observing the outdoors, and that their bodies are nourished by physical activity as well," she said. "In Oregon, it rains a lot and having wet, cold feet outside is not fun. We hope rain boots keep little feet warm and dry and allow children to spend more time outside," Hamilton said. This is the second year working with Oaki on the Make a Splash program, and Hamilton said the company supports the agency's goal of encouraging outdoor play for young children. "They donate and discount all of the products we are able to provide to families in Clackamas County and have been great partners in this year's expansion of smaller-size boots for young children," she said. The Gladstone Center for Children & Families recently hosted a free rain boot pick-up site for families who attend its parenting classes on Thursday nights. "She got to pick them out herself. 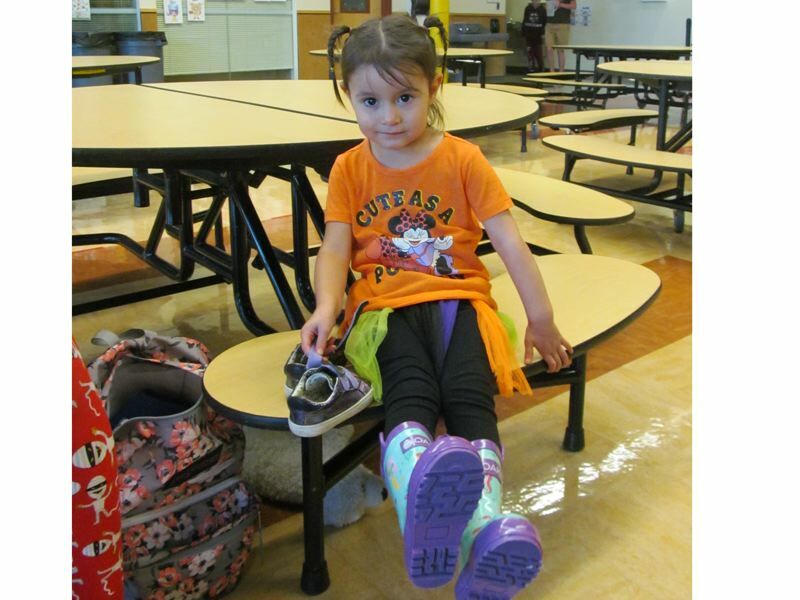 Now when we go to meet her sister from the bus, she can walk there," said Marie Cossey as she watched her 2-year-old daughter, Lillian, try on the colorful Woodland boots. Hillarie Brady noted that the best thing about getting new rain boots for Jerom, her 4-year-old son, is that now "he will be able to jump in puddles." Melissa Strosser brought her nearly 3-year-old twins, Mira and Violet, to the event. Mira chose the Woodland boots while Violet picked out the Mermaid boots. "Now we can go outside in all weather, and we don't have to worry about changing shoes," Strosser said. "It is so nice to have boots, especially when kids run through puddles," said Kaytie Baldwin, whose 2-year-old daughter, Stella, chose the Mermaid boots. The Gladstone event took place before Terrific Toddlers, a class Hamilton teaches at the Gladstone Center for Children & Families. Cossey said she has been coming to Hamilton's classes for almost six years. "The best thing about her classes is the educational materials and the way Chelsea presents them. I come year after year to get all the new stuff," she said. The classes are offered by the Early Learning Hub and Clackamas Parenting Together, initiatives that Hamilton's office leads. The mission of the Early Learning Hub is "to ensure that early childhood systems are aligned, coordinated and family-centered, that children are supported to enter school ready to succeed, and that families are healthy, stable and attached," Hamilton said. Clackamas Parenting Together provides high-quality parenting education programs and classes and supports all Clackamas County families with children up to 6 years old. These two programs work closely together in Clackamas County and collaborate on many programs and local events. Hamilton has taught parenting classes at the GCCF for 10 years, including Beautiful Babies, Terrific Toddlers and Growing Up. "Parenting is a full-time job that no one can really train for ahead of time. Children are always growing and changing, and this challenges parents to continually be growing, learning and changing as well," she said. "Having a safe place to come and talk to other parents about what it is like to be caring for young children is what these programs are all about." The classes support parents in their most important job, and meeting and talking to other adults for several hours during the week can be a break from isolation and a relief. "We teach parents tips and information about positive parenting and use the group knowledge to solve challenges and problems and support everyone who attends," Hamilton said. The three GCCF classes that Hamilton teaches are free and open to any interested parent or caregiver; they may come each time or just once. "We appreciate an email RSVP because we provide dinner and child care, and we want to make sure to be prepared for whoever comes each week," she said. In addition to the classes Clackamas Parenting Together offers in Gladstone, a wide variety of other courses are available at various locations throughout Clackamas County. "Our website has a calendar with all of the classes posted. Most classes are free and include dinner and child care," Hamilton said. "We offer classes in Spanish and English and try to always have programs happening in different areas of the county, so that families do not have to drive too far to find a program that is right for their family." Free classes are offered monthly from September through May at the Gladstone Center for Children & Families, 18905 Portland Ave. Call 503-367-9116 for details. Free dinner and child care is provided. • BEAUTIFUL BABIES: This group for parents of mobile babies and young toddlers meets from 6 to 8 p.m. the first Thursday of every month. Topics include child development, parenting styles, taking care of yourself, sleeping, feeding and playing with your child. • TERRIFIC TODDLERS: This group is for parents with children 2 to 3 years old. It meets the second Thursday of every month. Topics include toilet training, child safety, positive discipline techniques, learning through play, and encouraging language and social development. • GROWING UP: This group is for parents who have children 3 to 6 years old. It meets the third Thursday of every month. Topics include school readiness, screen time, encouraging independence, positive discipline and promoting healthy sibling relationships.